How the heck did all that gas get there? Researchers have discovered an astonishing amount of it bridging galaxies, stretching across a stream that is 2.6 million light-years across. 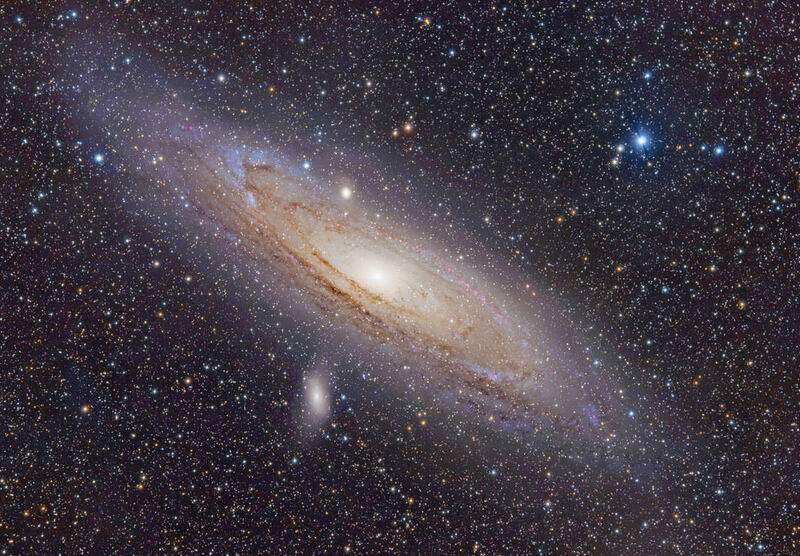 This is more than a million light-years longer than a similar stream that was previously found in the Virgo Cluster. The atomic hydrogen gas is about 500 million light-years away and was spotted with the William E. Gordon Telescope at the Arecibo Observatory in Puerto Rico. Its origins are unknown, but one hypothesis postulateas that a larger galaxy passed close to smaller galaxies in the distant past, drawing out the gas as the larger galaxy moved apart again. Alternately, the large galaxy could have pushed through the group and disturbed the gas within it. The research will be published shortly in the Monthly Notices of the Royal Astronomical Society. It’s long been a mystery for astronomers: why aren’t galaxies bigger? What regulates their rates of star formation and keeps them from just becoming even more chock-full-of-stars than they already are? Now, using a worldwide network of radio telescopes, researchers have observed one of the processes that was on the short list of suspects: one supermassive black hole’s jets are plowing huge amounts of potential star-stuff clear out of its galaxy. At the ends of both jets, the researchers found clumps of hydrogen gas moving outward from the galaxy at 1,000 kilometers per second. One of the clouds has much as 16,000 times the mass of the Sun, while the other contains 140,000 times the mass of the Sun. The larger cloud, the scientists said, is roughly 160 by 190 light-years in size. “This is the most definitive evidence yet for an interaction between the swift-moving jet of such a galaxy and a dense interstellar gas cloud,” Morganti said. “We believe we are seeing in action the process by which an active, central engine can remove gas — the raw material for star formation — from a young galaxy,” she added. The researchers published their findings in the September 6 issue of the journal Science. If you live in the U.S. you may be enjoying a sultry summer day off in honor of Independence Day, or at least have plans to get together with friends and family at some point to partake in some barbecued goodies and a favorite beverage (or three). And as you saunter around the picnic table scooping up platefuls of potato salad, cole slaw, and deviled eggs, you can also draw a correlation between your own steady accumulation of mayonnaise-marinated mass and a distant hungry galaxy located over 11 billion light-years away. Astronomers have always suspected that galaxies grow by pulling in material from their surroundings, but this process has proved very difficult to observe directly. Now, ESO’s Very Large Telescope has been used to study a very rare alignment between a distant galaxy and an even more distant quasar — the extremely bright center of a galaxy powered by a supermassive black hole. The light from the quasar passes through the material around the foreground galaxy before reaching Earth, making it possible to explore in detail the properties of the in-falling gas and giving the best view so far of a galaxy in the act of feeding. Galaxies quickly deplete their reservoirs of gas as they create new stars and so must somehow be continuously replenished with fresh gas to keep going. Astronomers suspected that the answer to this problem lay in the collection of cool gas from the surroundings by the gravitational pull of the galaxy. In this scenario, a galaxy drags gas inwards which then circles around it, rotating with it before falling in. Although some evidence of such accretion had been observed in galaxies before, the motion of the gas and its other properties had not been fully explored up to now. Astronomers have already found evidence of material around galaxies in the early Universe, but this is the first time that they have been able to show clearly that the material is moving inwards rather than outwards, and also to determine the composition of this fresh fuel for future generations of stars. And in this particular instance, without the quasar’s light to act as a probe the surrounding gas would be undetectable. “In this case we were lucky that the quasar happened to be in just the right place for its light to pass through the infalling gas. 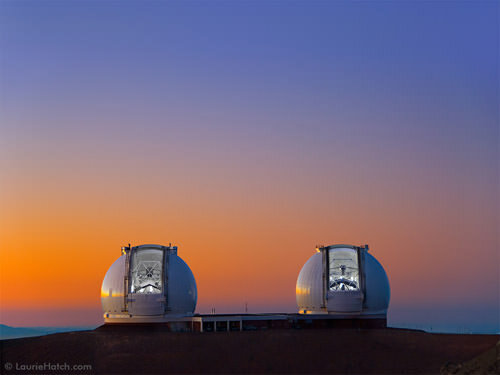 The next generation of extremely large telescopes will enable studies with multiple sightlines per galaxy and provide a much more complete view,” concluded co-author Crystal Martin of the University of California Santa Barbara. This research was presented in a paper entitled “Signatures of Cool Gas Fueling a Star-Forming Galaxy at Redshift 2.3”, to appear in the July 5, 2013 issue of the journal Science. Solid, liquid, gas … those are the states of matter we’re thoroughly familiar with, but what makes for a state of matter? And are there other states of matter? Since people first made distinctions between them, the states of matter were defined by how the matter behaved, in bulk; so a solid had a fixed shape (and volume), a liquid a fixed volume (but changed shape to fit the container it was in), and a gas expanded to fill its container. Once we realized that matter is made up of atoms (and molecules), the states of matter were distinguished by how the molecules (or atoms, in an element) behaved: in solids they are both close by and in a fixed arrangement (e.g. in crystals), in liquids close by but the arrangement is not fixed, and in gases not close by (so no particular arrangement). But what about plasma? Sorta like a gas – so as it fills any container it’s in, it’s a gas – but not (the ions and electrons interact in completely different ways, in a plasma, than molecules (or atoms) do in a solid, liquid, or gas). Hence, plasma is the fourth state of matter. Things got a bit more complicated as scientists studied matter more carefully. For example, if you heat water in a strong, but transparent, container, above a certain temperature (and pressure) – called the critical temperature (critical pressure) – the liquid and gas states become one … the water is now a supercritical fluid (you may have seen this demonstrated, in a chemistry class perhaps, though likely not with water!). Then there’s the distinction between crystals (crystalline state) and glasses (glassy state); both seem very solid, but the arrangement of molecules in a glass is more like that of molecules in a liquid than those in a crystal … and glasses can flow, just like liquids, if left for a long enough time. Is there a ‘fifth state of matter’? Yes! A Bose-Einstein condensate (BEC) … which is like a gas, except that the constituent atoms are all (or mostly) in the lowest possible quantum state … so a BEC has bulk properties quite unlike those of any other state of matter (quantum behavior become macroscopic). In astrophysics, there are quite a few exotic states of matter; for example, in white dwarf stars matter is prevented from further (gravitational) collapse by electron degeneracy pressure; the same sort of thing happens in neutron stars, except that its neutron degeneracy pressure (there may also be an even more extreme state of matter, held up by quark degeneracy pressure!). There’s also a counterpart to ordinary plasmas: quark-gluon plasma (in an ordinary plasma made of hydrogen the atoms are broken into electrons and protons; in a quark-gluon plasma protons and neutrons ‘melt’ into their constituent quarks and gluons). Are there related Universe Today stories? Sure! For example: Forget Neutron Stars, Quark Stars May Be the Densest Bodies in the Universe, Schwarzschild Radius, and Next Generation Magnetoplasma Rocket Could be Tested on Space Station. States of matter, including some exotic ones, is something you’ll find discussed in Astronomy Cast; for example this Questions Show.